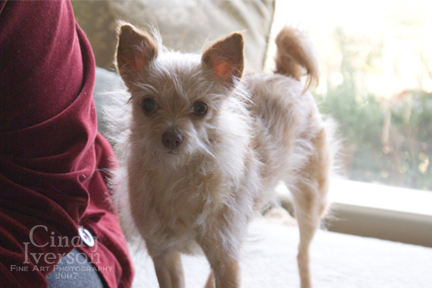 My mother brought her little doggy Chica over for a visit on Saturday. I wanted Chica to meet the kitties, because she's really very well-behaved with her own kitty roomate, Mollie and doesn't have any interest in cats that she sees on her walks. And just as predicted, Chica was a very well-behaved and gracious little guest. She didn't bark once. 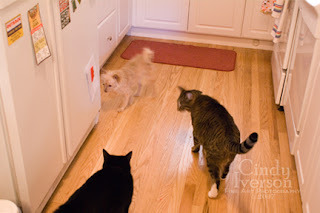 I had figured that the two cats Chica would meet first would be Dexter and Dee Dee because they are the "official greeters" around here when guests arrive. I was wrong. 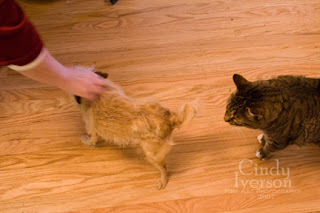 Interestingly, Thomasina was the first kitty to meet Chica. I thought there would be a lot of hissing and carrying on with Thomasina since she tends to be quite a diva around here. But there wasn't! Thomasina just made herself very big and puffy for the first few minutes. Then her tail went down and her posture relaxed, and she proceeded to follow Chica everywhere! Then Dexter woke up from his nap and started tailing Chica too. The poor little dog was so small in comparison to even our petite 7 lb. Thomasina, let alone our massive mancat, Dexter! Mom and I followed the little parade around the house so we could rescue Chica if necessary. 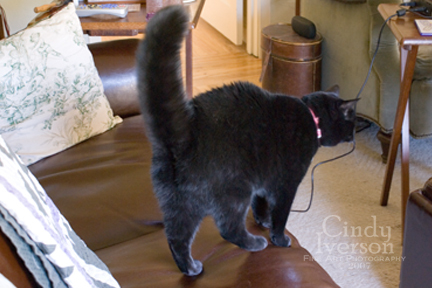 Chica was so curious about all the new smells to discover that she was pretty much ignoring her followers. Dexter never hissed either. He didn't even puff up his tail. He was completely fascinated by this little creature that was obviously not of the feline persuasion! Over the course of the visit, all the kitties ended up meeting Chica except for Lydia (she's too shy for visitors). And there was no hissing or hitting or rudeness of any kind. I'm such a proud kitty Mommy! Dee Dee did end up hissing twice during the visit but those hisses were directed at Gus Gus who was annoying her as usual. Tom Tom didn't like the dog at all and made himself scarce, but the others seemed completely baffled and their curiousity kept them entranced. They couldn't seem to figure out what this little creature was. It looked kinda like a rodent... kinda like a cat... kinda like a squirrel... definitely not a bird... what the heck was this thing???? When Chica had had enough of being stared at by all the giant kitty faces, she jumped up next to Mom and felt safer. 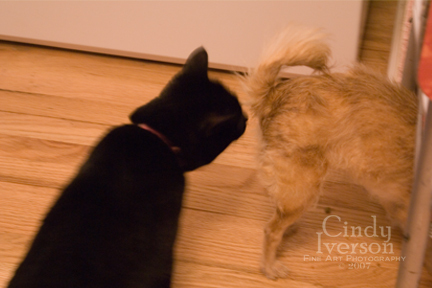 The kitties would just watch her and sniff in her general direction. What the heck was this thing, anyway? Then Dexter came over to me and started to softly "meow" while touching me lightly with his lifted paw as if to say, "Mommy, is this thing staying here? Is it going to live here now? Do I have to like it? Do you still love me?" I gently assured him by saying, "Chica is just visiting, Dexter," which didn't assuage his feline anxiety. Then I said what I often say, "Dexter, I loved you first and I love you best." He was content with that answer and went off to get a snack. Such an adorable little pooch! 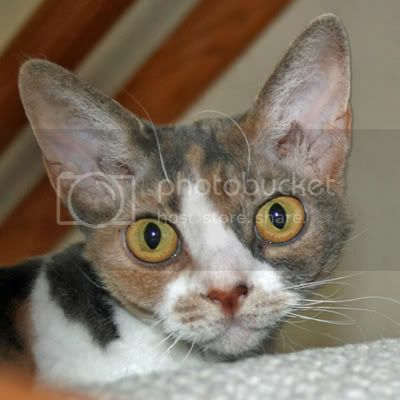 Cindy you have very well mannered kitties and I wonder if you could come too, that is if your are feeling well again. I would like to invite you to come to my Victorian Tea party Wednesday afternoon...I hope you can stop in for a nice cuppa tea and a crumpet or marzipan mouse. Chica really is a teeny-tiny little thing! That's great that all the kitties got along so well with Chica. I am quite impressed! Very nicely behaved kitties and Chica too. Now, if Chica had come here...Tigger would have attacked. He fancies himself a fierce attack cat, having had a go round with my sister's Jack Russell terrier some years back. Kayley is a cat-friendly dog, since my sister has two cats, so she went to say hello to Tigger, who ran up stairs. Kayley ran upstairs. We heard a KIYIKE! and Kayley ran back downstairs, followed by Tigger. We had to rescue Kayley, who was backed into the corner by our big orange bobtail Tigger, blown up to three times his usual size, sleeves rolled up and prepared for a further rumble. It was priceless! Ha! I love the fluffed up tail. Love it when our kitties do that, too. They think they look so scaryyyyyyyy! LOL! How sweet! Our cats have our dog fooled. Annie, our dog, is leary of our cat, Callie. Love the first photo - she is really fluffed out! I enjoyed your account of this important pet convention, Cindy. had to stop in and see all your kittys. I love cats. I have one inside.if you come visit go to the bottom of my page. i would have a dozen,but hubby will not allow it. I will have to just come back and love yours. Awe!! Chica is adorable and I am so glad your kitties welcomed him! I have really enjoyed this tour of your garden. Your pictures are simply gorgeous. Thanks for the eye-candy!